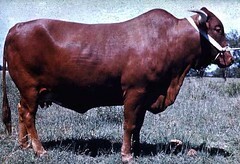 Characteristic body conformation, large size and spreading horn that are oval in cross-section; the preferred coat colour is dark red; good walking and grazing ability; easy calving, exceptionally good mothering ability that provided ideal mother line for crossbreeding and the development of hardy composites; good longevity; good quality beef and high performance tropical beef breed. Mostly maintained by commercial farmers (of European origin) in South Africa, and is the most popular indigenous breed. Also found in Botswana, Mozambique, Namibia, DR Congo, Zambia and Zimbabwe (Felius, 1995).